Holiday Pet Poisoning Myths Debunked! Holiday festivities, decorations and rich foods can wreak havoc on undiscerning pets who love to taste test everything that appears new and interesting. While pet owners need to be made aware of the very real and dangerous threats to pets this time of year, the veterinarians at Pet Poison Helpline would also like to debunk several common myths that cause unnecessary stress each holiday season. According to the veterinarians at Pet Poison Helpline, these are the most common myths concerning pet safety during the holiday season. Myth #1 – Poinsettias are highly toxic. Although they have a bad rap, poinsettia plants (Euphorbia pulcherrima) are only mildly dangerous to dogs and cats and their relative toxicity has been quite exaggerated. The most problematic component of the plant is its sticky white sap that may cause mild mouth or stomach irritation if ingested. Contact with the skin may also result in mild irritation. However, serious poisoning is not expected from ingestion. Myth #2 – Mistletoe is toxic. Like poinsettias, American mistletoe, which is a popular plant used as holiday décor, also gets a bad rap. Rumors of its toxic nature are largely attributed to its cousin, European mistletoe. 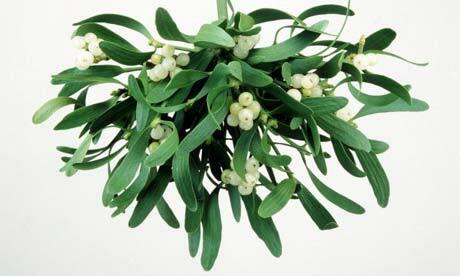 Though ingestion of American mistletoe leaves or berries may cause mild stomach upset, serious or life-threatening poisoning is not likely. Myth #3 – Fruitcake is a healthy holiday treat. While fruitcake may be a fine food for people, it can actually be deadly to pets. Grapes, raisins and currants are common ingredients in fruitcakes and can result in kidney failure in dogs if ingested. Additionally, fruitcake that has been soaked in rum or other alcohol may also prove poisonous to your pet if ingested. Alcohol is rapidly absorbed into the bloodstream and can affect pets quickly, causing a dangerous drop in blood sugar, blood pressure and body temperature. Intoxicated animals can experience seizures and respiratory failure. Myth #4 – Tinsel is a pet-friendly decoration. An ornament that pet owners should avoid is tinsel for decorating trees. If you own a cat, toss the tinsel! What looks like a shiny toy can prove deadly if ingested. While tinsel itself is not poisonous, it can result in a severe linear foreign body, which occurs when something “stringy” wraps around the base of the tongue or anchors itself in the stomach, rendering it unable to pass through the intestines. As the intestines contract and move, the string can slowly saw through the tissue, resulting in severe damage to your pet’s intestinal tract. Treatment involves expensive abdominal surgery. It’s best to keep tinsel, as well as ribbon, yarn and thread out of your pet’s reach. Lilies, including tiger, Asiatic, stargazer, day and Easter, make lovely centerpieces but are also extremely toxic to cats. These beauties fall into the category of real and acute danger. As little as one or two petals or leaves, and even the pollen, can cause sudden kidney failure. They should be kept well out of kitty’s reach. Thankfully, dogs are not as severely affected by lilies with only mild stomach upset expected. While not as toxic as lilies, ingestion of Christmas cactus by dogs and cats can cause vomiting and diarrhea. Likewise, the spiny and leathery leaves of the Christmas or English holly can result in significant damage to the stomach and intestines of dogs and cats. The holly’s berries have mildly toxic properties, but are fairly tolerable in most pets. While death is not likely, it’s best to keep your pets away from these holiday plants. Filling your house with the smell of nutmeg or pine is inviting, but if you heat scented oils in a simmer pot, be aware that it can cause serious harm to your cat. Some liquid potpourris contain chemicals called cationic detergents, which can result in severe chemical burns in the mouth, fever, difficulty breathing and tremors. Dogs are not as sensitive to the chemicals but may still suffer burns so it’s still better to be safe than sorry. Scent your home with a non-toxic candle in a safe no-pet zone. With the holiday season comes delightful baked goods, confections and other rich, fattening foods. However, it is not wise, and sometimes quite dangerous, to share these foods with your pets. Keep them on their regular diets over the holidays and do not let family and friends sneak them these kinds of treats. Some of the most dangerous foods are chocolate and cocoa, sugarless gum and candy containing xylitol, leftover fatty meat scraps, and unbaked bread dough containing yeast. Make this holiday season merrier for you and your pets by keeping dangerous items safely out of their reach. If, however, you think your pet may have ingested something harmful, take action immediately. Contact your veterinarian or Pet Poison Helpline at 1-800-213-6680. Pet Poison Helpline is a service available 24 hours, seven days a week for pet owners and veterinary professionals who require assistance treating a potentially poisoned pet. The staff can provide treatment advice for poisoning cases of all species, including dogs, cats, birds, small mammals, large animals and exotic species. As the most cost-effective option for animal poison control care, Pet Poison Helpline’s fee of $35 per incident includes unlimited follow-up consultations. Pet Poison Helpline is available in North America by calling 1-800-213-6680. Additional information can be found online at www.petpoisonhelpline.com. This entry was posted in Holiday dangers, Pet Poison Helpline on December 24, 2010 by yourfriends.